Scabs are port of a normal process in your body to heal wounds. When a scab forms, it keeps you from bleeding excessively. It also serves to protect your body from outside bacteria and viruses that could enter through a wound. When you get a scab, it is a sign that your body is trying to heal. In general, you should not remove the scab. Removing the scab will make you more likely to scar, and it could allow outside viruses, dirt and bacteria to get into your wound. In some cases, you may want to get rid of the scab even though removing it is not the healthiest option. Rather than pulling it off, there are a few ways to speed up the healing process. While there are expensive products available to prevent scarring and help remove scabs, your best bet is to use natural home remedies. No matter what, you should not pick at your scab because this can cause scarring. 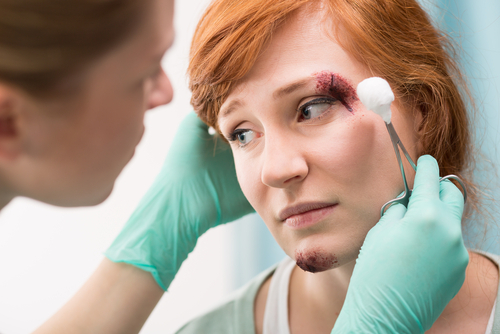 Even though having a scab visible on your face may be embarrassing, it will be more embarrassing to have a scar on your face for the rest of your life. You need to make sure that your scab is completely dry before you do any of the following remedies. If it oozing pus, you need to make sure that it is clean to prevent infections. It also needs to dry out and harden before you apply any of the following remedies to it. Plantain leaves are known for their natural anti-inflammatory properties. As such, they are great at reducing redness around cuts and scabs. To use this home remedy, pound ten leaves with a mortar and pestle to get some of the juice out. Then, apply the juice to your dry scab to help the healing process. A warm compress can help you get rid of a scab fast and feels wonderful on the scab if it is itchy or inflamed. To make a warm compress, you just need warm water and a towel. Soak the towel in the water and then press it against the scab. You need to make sure that you do not unintentionally rub it or scrape it against the scab because this can cause the scab to break, bleed and scar. It is possible that the warm water will dissolve some of the scab, so you may need to apply the warm compress again. You will also want to keep medications like Neosporin or bacitracin on hand. These medications can be used to prevent an infection from forming while also helping your scab to heal. Most homes contain onions in the kitchen, so this is a great home remedy. An onion has natural antimicrobial properties that can help prevent infections and help your wounds heal. Honey is also known for its healing and antimicrobial properties. Pound an onion into a paste before blending it with honey. Afterward, apply the blend to your scab and allow it to sit for ten minutes before you rinse the mixture off. You can do this four times a day to achieve the best results. Many people use Epsom salts to relive sore muscles and calm your mind, but they can also help with inflammation caused by scabs. Using Epsom salts can help you reduce the redness around the scab, which will make it less apparent to anyone looking at it. Soak your scab in water that contains Epsom salts for an hour or longer. Afterward, rinse off the scab and dry it gently. Make sure that you do not rub or pick at the scab. Following the Epsom salt bath, the skin around your scab should be tighter. Garlic is well known for its antimicrobial and antibacterial properties. To make a super-charged, scab-healing solution, mix two or three cloves of garlic into a cup of wine. Let the garlic sit for two hours and then strain the solution. Use a cotton ball to apply it to your scab and allow it to sit for ten minutes. Do not wait too long to rinse it off because the garlic can irritate your skin if it sits on the scab for too long. This type of salt is often used as a deodorant or astringent. You can find it pre-ground in a form that looks like baking soda. It helps to tighten the scab and loosen its hold on the skin by loosening blood vessels. You just have to grind up a little potassium alum and mix it with water to make a paste. Then, apply the paste to your scab and allow it to dry completely before you rinse it off. Keep applying, drying and rinsing until the scab is removed completely. Aloe vera is amazing at boosting circulation and preventing bacterial growth. Apply it to any scab or wound as a juice. You can do this three or four times a day and rinse off the solution with cool water. Tea tree oil is amazing for healing and antiseptic properties. It can help you cure your scab and is fairly inexpensive to buy. Use a cotton ball to apply the oil to your scab. If you have acne scars or other cuts, you can also apply tea tree oil to them. The pH balance in apple cider vinegar can help boost cell growth and heal your scab. Mix about 5 ml of apple cider into 50 ml of water. Afterward, apply the mixture to your scab using a cotton ball and wait 20 minutes before rinsing it off with lukewarm water. You can repeat this process as often as you need to to get rid of your scab. Baking soda helps to heal your scab by tightening the skin around it and loosening your scab. It also has antiseptic and antifungal properties that will help to kill any bacteria or fungus on your scab. Blend baking soda and sodium bicarbonate with just enough water to create a paste. Then, apply the mixture to the scab and allow it to dry. Afterward, rinse the mixture of. You can reapply it as often as you need to. – Vitamin E oil can help your scab heal and prevent scabbing. – Do not itch or rub the scab. Your scab itches during the normal healing process, but do not scratch it. – Use Neosporin to keep your scab clean. – Never apply makeup on a scab.